If you get takeout food on a regular basis, chances are you’re eating a lot of French fries. The popular side order is on the menu of dozens of national chains, with American consuming an average 29 pounds of French fries at home and at restaurants every year. They’re delicious, sure, but also full of saturated fats, salt, starch, and other things that we tend to eat to the detriment of our overall health. If you crave crispy spuds but don’t want the consequences of French fry calories, abstinence isn’t your only option. Christopher Mele of The New York Times recently examined a number of healthy alternatives for your French fry fix. Option Two: Pass on fries that come with toppings. Chili, cheese, or gravy can add hundreds of calories, while condiments like mayo or aioli can add 100 calories or more to the serving. Option 3: If you really want to cut down while still enjoying that salty, starchy combo, there are healthier alternatives. 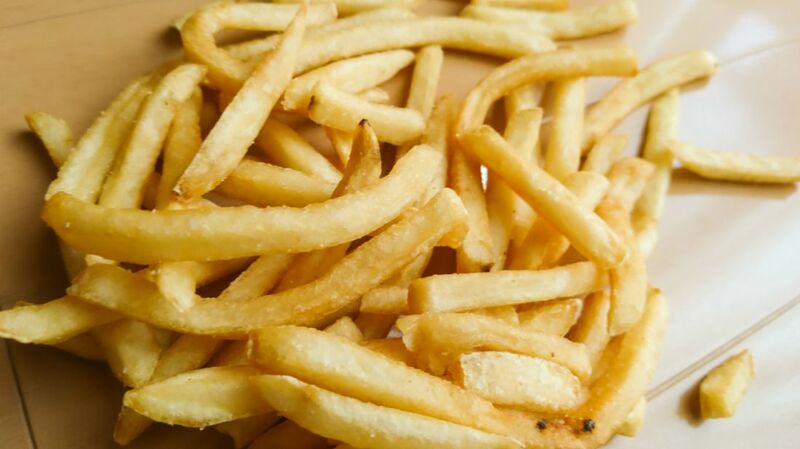 Baking French fries at home lets you drizzle on olive oil or peanut oil. If you’re going out, home fries—which often have the nutritionally dense skin still on the potato and are usually prepared in a skillet—are a step up from their cut and deep-fried counterparts. You can also opt for sweet potato fries, but be cautioned that their increased Vitamin A and fiber doesn’t diminish their calorie- and fat-dense profile if they’re layered in grease. Sadly, the worst offenders in this category might be the tastiest. Curly fries and waffle fries are typically higher in calories and fat because they have a great surface area to absorb oil. A large order of curly fries at Arby’s runs 650 calories with 35 grams of fat. If you enjoy French fries but want to stay health-conscious, there’s no need to cut them out of your life entirely. Just make sure they’re taking up only a portion of your plate and not the entire surface area.